Generally seen in large clusters with rosettes of hematite comprising the matrix, I was rather excited to find these single crystals in Tucson. I always like to experience the energy of a crystal group before offering it on the site when I can, and this seemed the most economical way to go about it! From the Guangdong Province, China, these crystals are stained red and black by the oxidation of their hematite bases. 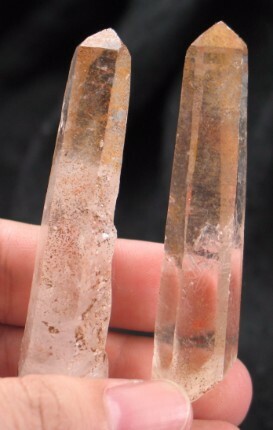 Not yet fully formed as phantoms, the oxidation is a layer that is being enclosed in the quartz as it grows. 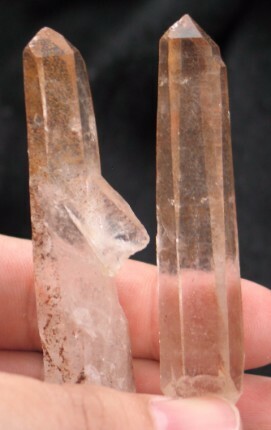 As you turn the crystal, you can see on the shaft where the luster signals the presence of red quartz. The red iron areas have a dusty feel, and washing too much will remove the red color leaving nearly colorless quartz beneath. 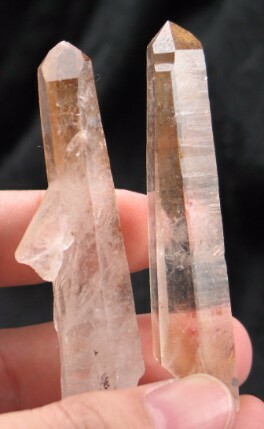 Taking millions of years to form, quartz crystals are all very ancient and we share the benefit of their wisdom. While these crystals are very old, they feel very young, and at an interesting point in their development. These are crystals creating their phantom layers, they are at a milestone in their lives that will be marked by the red hematite. What a blessing to be able to share! Singing crystals, they tink beautifully when they touch. They speak to me of beginnings, and creation. They are very root chakra and physical-being oriented, life in its primal forms.